La Clos de la Roche is located on the outskirts of the quiet village of St Georges du Bois, 30 minutes from Saumur and 20 minutes from Angers. The cottage was built around 1750 and extended in 1850; the original beams are still visible as are the roof trusses on the upper floor. There is a large bread oven on the ground floor. Previous owners have left their mark on the house - Jean Martineau, who lived here in 1846 and made wooden clogs (sabots) carved the date, his name and occupation (sabotier) on the wall upstairs. The cottage has been renovated to a high standard and offers wonderful views over farmland, peace and tranquillity. La Clos de la Roche is a gîte classified by the Ministry for Tourism as a Meublé Tourisme with three stars. The cottage is in the grounds of our home - La Jaclotiere. Kitchen & Dining area: Fully fitted with electric cooker, extractor, refrigerator, microwave and table seating four. High-chair. Wood stove and electric convector heater. Living room: Leather sofa and armchairs, satellite television (French with English-language news channels) with DVD player, bread oven. Traditional Godin wood stove and electric convector heater. Bathroom: Walk-in shower, wc and screened-off area with washing machine, hair-dryer, iron, ironing-board and clothes airer. One electric convector heater and radiant panel heater with fan boost. Bedroom 1: Large double bed (2 metres long), hanging wardrobe. Large door/window with views over farmland. Armchair and blanket-box. Black-out and sun blinds on Velux. Electric convector heater. Bedroom 2: Standard single bed, black-out and sun blinds on Velux. Single Folding bed (flip-flop). WC & wash-basin opening off the bedroom. Electric convector heater. Cot with mattress & linen available (on request). There is a paved terrace in front of the cottage with garden furniture. Weber charcoal kettle barbecue provided with tools. We have a large garden with a picnic-table in a secluded corner. The rental includes bedding but not towels; towels can be rented for 5 euros per person per week. Beds are made up before your arrival. A daily allowance of 8 units of electricity is included in the rental. This will cover normal consumption in the summer but not when the room heaters are used. In cold weather we will light the woodstoves before your arrival. Wood is charged at 63 euros per cubic metre - the wood-box for the cottage holds sufficient for a week and is charged at 24 euros. Free WIFI is available in the gîte. There is secure storage for cycles and motorcycles. Animals are not allowed - Non smoking gite. Please note that, due to age of the cottage and the different periods of construction, there are steps between every room. Click here to download our leaflet (1.5 MB). 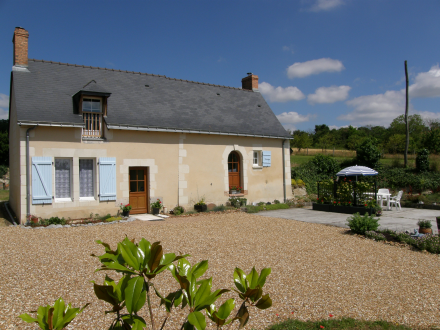 Click here for pictures of the gîte. Save money by booking the gîte and your ferry together with Brittany Ferries.